When I was at City Hall, this would be the door through which I would walk the most. 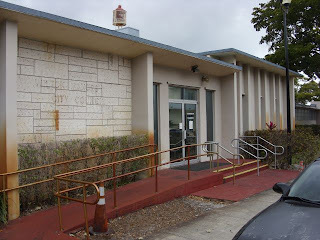 The handicapped access ramp is in front of some Ficus in a hedge that was attacked by the white fly that is destroying the plants here, and that is in front of the wall that used to read "Wilton Manors City Council" and under that would be a plaque that had the Council and Mayor's name from when it was built. Now what you see are the shadows of what once was. The letters and plaque have been removed for safe keeping by the Wilton Manors Historical Society. What remains are the outline of what was there, and the rust stains of the water from the irrigation as it collected behind the plaque. This was the newer wing, dedicated in 1970. The doors opened to an ante-room that you would go into the Commission Chambers to the right, the restrooms to the left. Those restrooms were the newest place in the entire building by my unscientific view. The Vertical colums that are to the right of the doors are there to give the room some semblance of grandeur. The space was originally not designed for the Commission. It was originally a long and narrow bay of a place and that served its original purpose - that of a garage for the Fire Trucks of Wilton Manors. There was a firehall built just down the block and this room was made into the meeting space that I have spent many hours sitting listening to My City Government in action. Quite an entertaining group of people, I highly recommend it. Now the place is empty of workers and full of dust and memories.